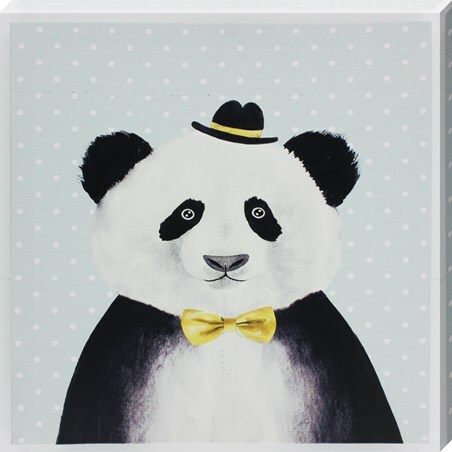 Arriving smartly dressed in his best bowler hat and matching bow tie, this is surely the suavest Panda you've ever seen! Charming with it's soft fur like brush strokes and delicate dotty pale blue background, this canvas print is perfect to suit any room in the house which needs a little quirky pick-me-up. Ideal for adding a gentlemanly touch to your minimal living space or an adorable new house mate for your ever growing animal collection, this Panda will fit right in! High quality, framed Panda In Bowler Hat, Smart Bear canvas print with a bespoke frame by our custom framing service.